We can win this campaign, but it will require real commitment to do so. We need all your support! Thank you. Please add your name to our list, by filling in the form on this page, so that we can communicate with you and you are happy to be communicated with. Please ask them to join us and sign up to the email list. You’ll find a “forward to a friend” button on our enewsletters or they can sign up from this website. 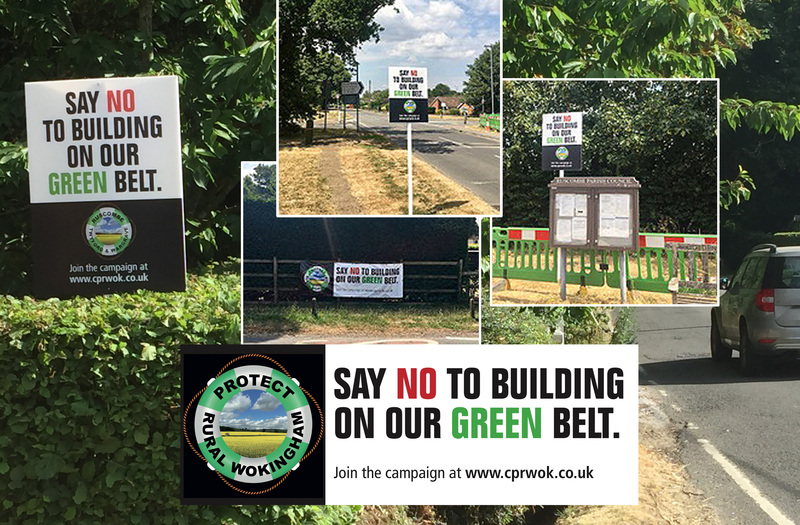 We want to get the campaign visible and demonstrate its importance for WBC residents, especially in the immediate area of the Ruscombe/Twyford/Wargrave Green Belt – so we need your help! 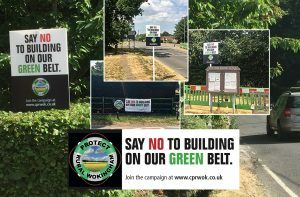 We’ve developed a range of materials from car stickers to 3-metre banners, along with A1 size “estate agent” posts for front gardens and A4 window posters, all with the distinctive campaign logo and message. Can you display something on your house/garden/car? Please drop us an email to let us know what you can use, and we will deliver! Several residents have kindly pledged money and the parish councils have kindly agreed to contribute per household. We need money to pay for campaign materials, the very best legal and planning representation. Please donate and ask your friends and neighbours to do so. We will need help on many levels, from preparing the Neighbourhood Plan to leaflet dropping. Please contact us by email campaign@cprwok.co.uk if you can help. When the preferred sites consultation occurs, we need to be able to respond in force and respond in a way which is meaningful in planning terms. By demonstrating strong support, we could encourage more Councillors to join us and maybe help them to achieve similar objectives in their Wards.